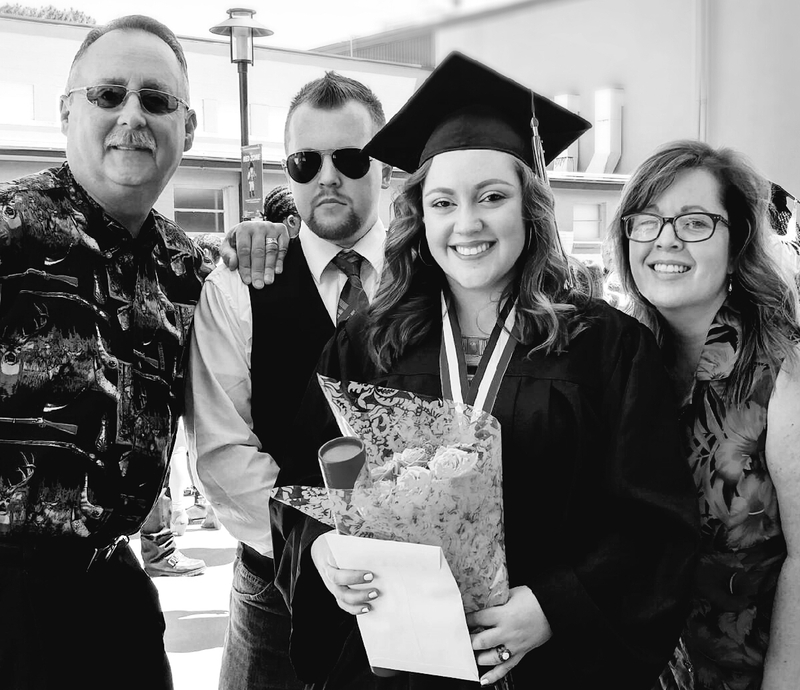 BAYTOWN, TX — Lee College will recognize more than 500 graduates who have earned associate degrees and certificates of completion at the Fall 2017 Commencement Ceremony. Dr. Cody Abshier, superintendent of the Liberty Independent School District, will deliver keynote remarks. 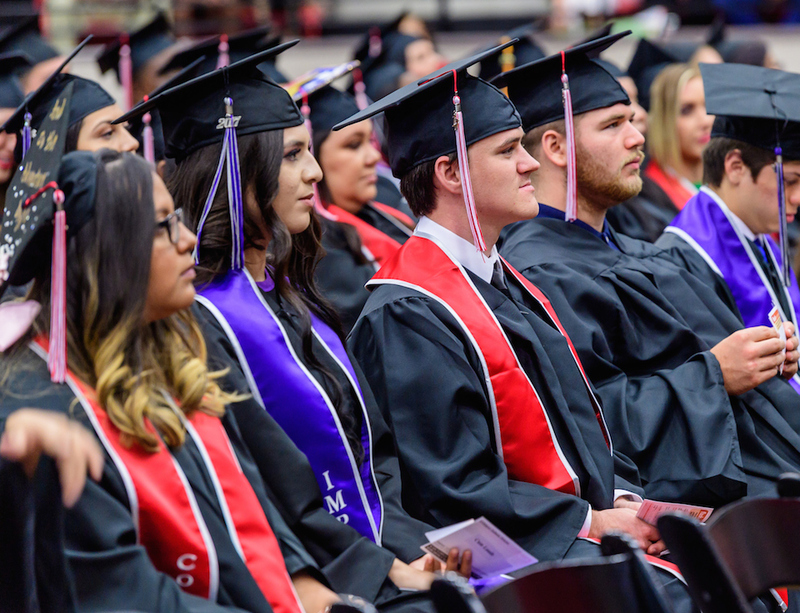 Fall Commencement will be held at 10 a.m. and 2 p.m., Saturday, Dec. 16, in the sports arena on campus. The ceremonies will also be streamed live online via the Lee College website at www.lee.edu. Selected by the Liberty ISD Board of Trustees to serve as superintendent of the district in 2012, Abshier holds a Doctor of Education degree in Educational Leadership from Lamar University, where he also earned a Master of Education degree in Educational Administration and Bachelor of Science degree in Education with an elementary endorsement and reading specialization. His doctoral dissertation, “Superintendent Perspectives of Financial Survival Strategies in Small Schools,” was published in “The Rural Educator,” the official peer-reviewed academic journal of the National Rural Education Association. 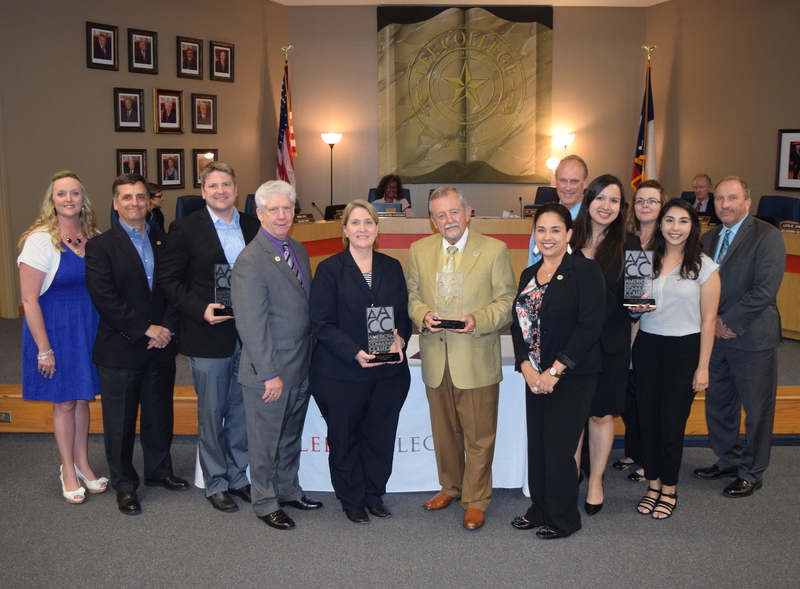 Prior to taking the reins at Liberty ISD, Abshier served as superintendent, assistant superintendent and principal for Devers Independent School District over the course of a four-year tenure. 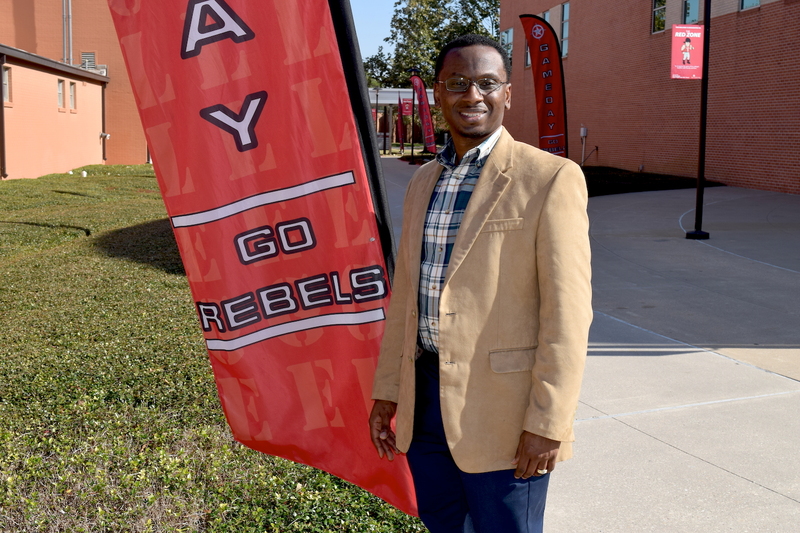 He was the principal of Anahuac Middle School from 2002-2008, and started his educational career as a teacher at Liberty Elementary School from 1990-1999 and Devers Junior High School from 1999-2002. Abshier and his wife, Kristi, are the parents of two grown children, Wil and Whitney. Lee College recognized more than 630 graduates at the 2017 Spring Commencement held Saturday, May 13, 2017, in the Sports Arena on campus. Sisters Tina Pennington and Mandy Williams, better known as “Red” and “Black,” delivered the keynote address and encouraged graduates to face their fears, polish their soft skills and remain strong and driven in pursuing their dreams. 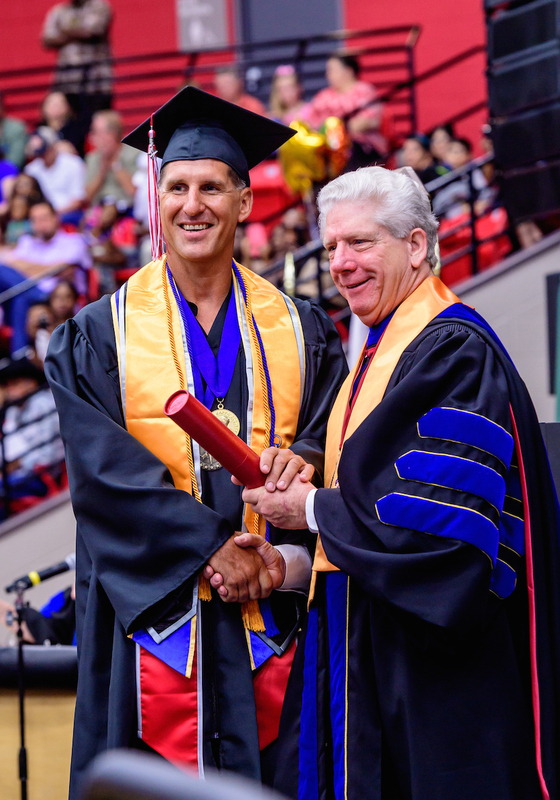 BAYTOWN, TX — As a capacity crowd packed with family, friends and supporters cheered and applauded from the audience, more than 630 Lee College graduates were recognized for earning associate degrees and certificates of completion at the 2017 Spring Commencement ceremonies. In their keynote address to the Class of 2017 – which included nearly two dozen IMPACT Early College High School students receiving their associate degrees before their high school diplomas – sisters, authors, educators and entrepreneurs Tina Pennington and Mandy Williams encouraged the graduates to remember that some of the greatest blessings in life can come from confronting the most difficult and challenging situations. Pennington and Williams, better known as “Red” and “Black” respectively, learned that lesson firsthand after Red’s husband was fired from his job and she turned to her sister for help mastering the family’s finances. Black, who earned an MBA in International Finance from New York University and London Business School before retiring from the oil and gas industry at just 40 years old, assured the nervous Red – a Theater Arts graduate at Wake Forest University who became a full-time wife and mother and was initially intimidated by financial terminology like “assets and liabilities” – that the job loss and subsequent processes of learning about personal finance and rebuilding her life would be the best thing to ever happen to her. The frank and candid messages the sisters exchanged during Red’s period of crisis formed the basis of their national bestseller, “What I Learned About Life When My Husband Got Fired!” which features practical guidance and advice about achieving financial health and a richer, more satisfying life. Initially launched by Neiman Marcus, the book has since been adapted into an educational program at KIPP Houston High School and incorporated into book study programs at more than 30 percent of Texas Department of Criminal Justice prison units. Along with financial literacy, Red and Black also emphasize the need for soft skills like critical thinking, problem solving, communication and teamwork. As the first woman to race the road course at Indianapolis, Black used racing analogies to present the graduates with an essential life choice: being a passenger who lets life control them, or being a driver who controls their own life. Remember the important corners on the track that require a steady hand, and keep the fun of the curves in perspective of the bigger picture, she said. Most of all, stay in the driver’s seat instead of simply coasting along. Lee College welcomed the 60 newest graduates of the Associate Degree Nursing program into the nursing profession at the annual Pinning Ceremony held Friday, May 12, 2017, in the Sports Arena on campus. Each graduate received a pin to signify completion of their Lee College journey and entry into the next phase of their lives and careers. The 60 newest graduates of the Associate Degree Nursing (ADN) program received pins to signify completion of their Lee College journey at the annual Pinning Ceremony, where they were also welcomed into the nursing profession and charged to devote themselves to the welfare of the patients that will soon be committed to their care. ADN faculty presented individual awards to students who displayed academic and clinical excellence and best represented the unique spirit of nursing, before calling each student to the stage one by one to be recognized. As a special twist this year, graduates were given the option of having a registered nurse of their choice join Director of Nursing Tracy Allen to congratulate them and affix the coveted metal pins to their starched, white uniforms. 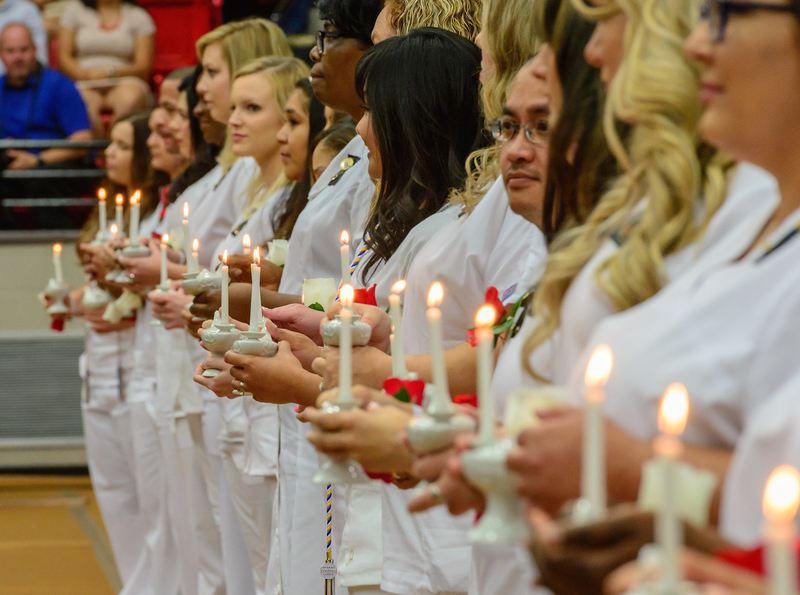 Graduates then lined up to receive the symbolic light of knowledge from their instructors, passing the live flame from one ceramic lamp to the next and reciting the Florence Nightingale Pledge taken by all professional nurses. Citing a quote from former Pres. Teddy Roosevelt about the importance of striving for success and staying in the arena despite failures and shortcomings, Allen praised the graduates for their consistent effort to complete the rigorous program and prove their knowledge and mastery of the important skills and abilities they need to be effective nurses. The nursing pins they earned at Lee College will become one of their most prized possessions as they continue into the next phase of their lives and careers, she said.